The Tiniest Tumbleweed is small for her age. So is her Sonoran Desert neighbor, a baby house sparrow. 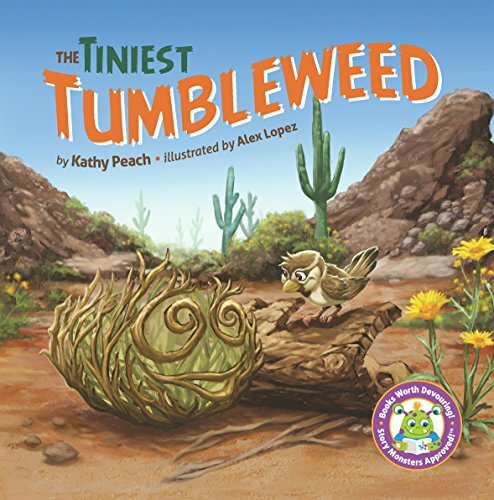 Through the incorporation of proven psychological concepts in helping children believe in themselves and their unique capabilities, The Tiniest Tumbleweed by first-time children's author, Kathy Peach, shows how the two desert companions work within their limitations and work together to become their very best selves. Together, they learn that you can be all YOU were designed to be, and that is just fine, just fine indeed. This book has been Story Monsters Approved! Kid-tested, judge-certified! The Tiniest Tumbleweed is available for purchase from Amazon, or you can purchase an autographed copy with a personal message directly from the author!